Tri-Action Auto offers NAPA EasyPay Financing with six months at no interest for a limited time for qualifying applicants. Maybe that is why we are the leading choice for auto repair among Chesterfield and Macomb Townships. You can trust our team to fix your car, regardless of the make or model, with accuracy and precision. With years of experience under the hood, our auto mechanics are the advisors for all things automotive related. Not only do we aim to impress you with our skills in the garage, we are also committed to earning your trust and loyalty, which is one of the reasons why we offer EasyPay Financing. When you are having an issue with your vehicle, Tri-Action Automotive is the first number you should call. We recognize that sometimes auto repair just doesn’t fit in your immediate budget. 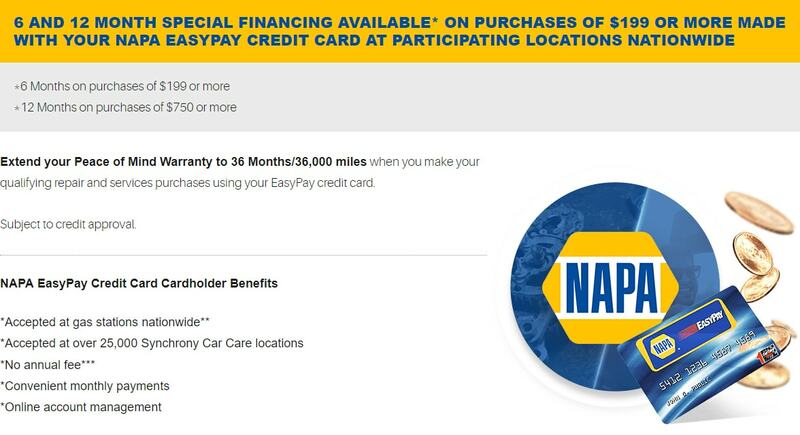 That’s why we offer EasyPay Financing through Napa Auto Care. At Tri-Action Auto, close to both Chesterfield and Macomb Townships, we are here to help you any way we can, and with EasyPay Financing, your car can receive the service it requires, without the repair putting a complete dent in your wallet. EasyPay Financing is subject to credit approval, along with certain requirements and specifications. We are conveniently located at 50002 Gratiot Avenue, Chesterfield, MI 48051.